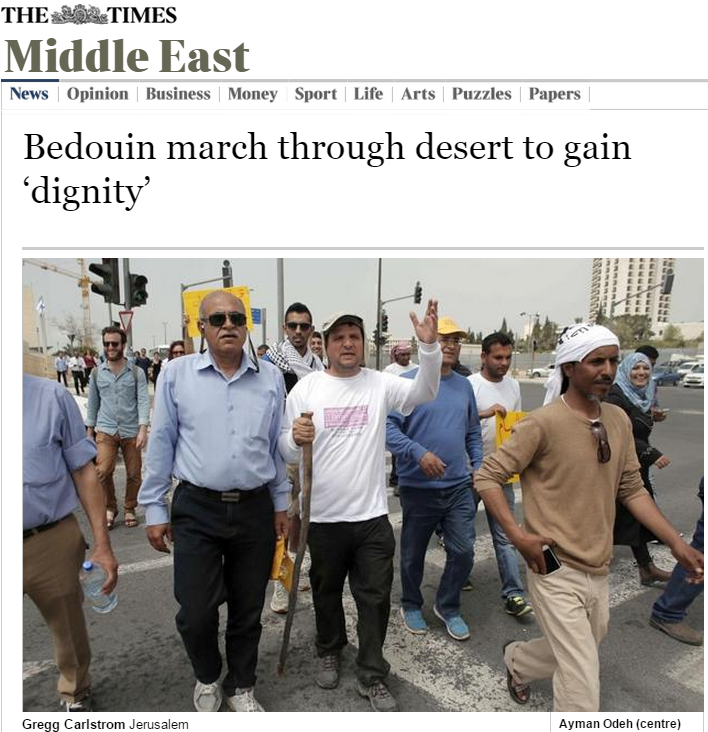 On March 30th, Times of London (The Times) published an article by Gregg Carlstrom titled ‘Bedouin march through desert to gain ‘dignity’. The leader of the Joint List, a coalition of Israel’s four Arab parties, arrived in Jerusalem yesterday after a four-day trek through the Negev desert. He was joined by members of Israel’s Bedouin on a march to draw attention to their living conditions. Later in the article, Carlstrom attempts to give some background on the plight of Israeli Bedouin. The Negev is home to about 200,000 Bedouin. About half of them have moved into seven towns built by Israel since 1967. The rest live in “unrecognised villages” which do not receive services from the state. Residents draw water from wells and supply their own electricity. Unemployment is rife. In 2013, Binyamin Netanyahu, the prime minister, advanced a bill, which would have demolished all unrecognised villages. It was shelved after protests. Carlstrom’s characterization of the bill is extremely misleading. The Prawer-Begin Plan (the development plan for Bedouin in the Negev, shelved by the government, that Carlstrom is alluding to) represented an effort to settle the problem of 70-90,000 Israeli-Bedouin living in unrecognized villages in the Israeli Negev, and the resulting land claims. The bill would have legalized most of the unrecognized land, but called for roughly one-third of this population to relocate (with full compensation in money and land) to recognized, planned and developed towns within a few kilometers of their current homes. Alternatively, as these Israeli-Bedouin are Israeli citizens with full civil rights protected under the law, they could of course choose to live elsewhere – indeed anywhere in the country. The plan also would have allotted billions of shekels to economic and social development projects for the Bedouin. Carlstrom’s omission is especially curious in light of Times of London report in 2013 on the very same bill, by Catherine Philp, which went into much more detail about plan, including the compensation and land offered to Bedouin Israelis. We urge Times of London editors to promptly correct the misleading passage. Why the British always tell lies on Israel? Yes, this lie is as stupid as it is transparent and I – a very near-neighbour of bedouin – have written about it – as has your estimable regular contributor, Richard Millett. Here’s my take from January 2014: http://wwwalwayswriteagain.blogspot.co.il/2014/01/modern-bedouin-tale-of-false.html. And if the mendacious newshounds of London don’t like pitta – then let them eat matza! Pesach sameach to one and all.